This is Day 2 of IceStormFrenzy2011. Both Steven and I have been working from home because we have received 1″ of ice and sleet underneath a layer of snow within the last 48 hours. Wind gusts of 40 mph and frigid temps have left us baffled as to why we still have power. The dogs are loving these “Saturdays” of laptops & couches, and I’m afraid they will have to readjust to the normal work day once the weather clears. After answering & sending e-mails, phone conferencing and doing as much as work-at-home allows, I’ve been occupying my free time with baby thoughts. Oh great, you say; here it comes. It’s going to be one of those posts. Well, perhaps, yes, but I think I finally have nailed down nursery ideas, which has been a more tedious process than I ever thought imaginable. I’m not a fan of cutesy baby stuff, and I really don’t like themes too much. I’d rather have a neutral room for a boy or girl to allow for gender-specific decor instead of bedding and the like. Who knows how long we’ll end up staying in this house, so if we happen to have Baby #2 while here, we can just switch around a few things. Based on our 14w ultrasound, we’re pretty certain Baby Shattuck is a mister. We’ll confirm that in another 3-4 weeks, but we’ll be surprised if it ends up being a little girl. That said, here’s the tentative master plan. I’ll have to get busy and finish a couple paintings that I have in my head. We also need to get a move on the commissioned robot painting by Mike Altman. He’s a local artist that we’ve seen in several different First Friday events around town, and he’s apparently mutual friends with some of ours. His style is acrylic quirky figures painted on cardboard, and we fell in love with his robot series last winter. 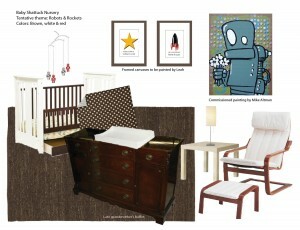 I’d really like him to complete a robot specifically for Baby Shattuck in the nursery colors (and not be too creepy weird). The dresser/changing table is actually my Grandma Fernsler’s buffet. It’s a beautiful piece that we’ve not used around our house much. I think it will be a perfect addition to the room. We really won’t have to purchase much of anything since we’re going simple and repurposed. The original plan was to use my mom’s (and her siblings’) old baby crib, but since it’s not up to code, we’re not sure how to get it back to shape. We found a neat 2-tone crib that we like, so we’ll probably end up purchasing it soon. I’ve already put a listing on etsy’s alchemy site to make a toddler or sand table out of the antique crib parts. We think it’s a great way to keep it in the family. Pretty much everything else in the room is already ours or on our registry, so here’s to saving money!